Scarborough is one of Toronto’s largest municipalities, so it’s no surprise you’ll find a vast mix of residents in this area! From cozy single family dwellings near the Town Centre to the multi-million dollar home owners along the Bluffs, Scarborough certainly has it all. And whether it’s dim sum at one of the Chinese eateries in the north or dinner at the marina along the southern shores – this area is as welcoming as it is diversified. And speaking of welcoming, Scarborough residents are certainly welcoming of Avonlea’s services. There are many residential pockets in this municipality and we’re proud to have serviced them all. Our Scarborough clients tell us the same thing: Browsing through Avonlea’s showroom is a treat! 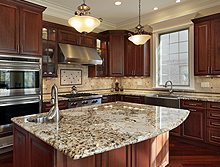 We’ve got marble tiles, granite countertops, glass backsplashes … in a superior range of colours and textures. Our showroom is staffed with design experts who will walk you through every step of the process. Avonlea clients know they will never get this kind of attention from the ‘Big Box’ stores. Our experts will sit down with you to assess your needs. After that, we’ll provide you with customized ideas and solutions based on your overall vision. Then we’ll get working to turn your home renovation dreams into a reality. On our website’s photo gallery, you’ll see the quality of Avonlea’s work. Our clients keep recommending us to their neighbours because we’re trustworthy and always fair. You won’t find any insincere contractors or soaring estimated costs here. Avonlea Renovations operates on professionalism and we let our track record speak for itself!